More than two years after human rights lawyer Stanislav Markelov and Novaya Gazeta journalist Anastasia Baburova were shot dead in central Moscow, a pair of radical nationalists has been convicted of their killing in a trial by jury. The main perpetrator, Nikita Tikhonov, faces life in prison, while his girlfriend and accomplice Yevgeniya Khasis faces up to 25 years. 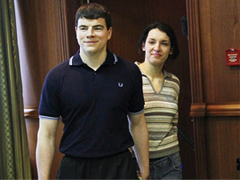 The prosecution had sought to portray the couple as radical nationalists bent on eliminating Markelov, a prominent defender of minority rights. But Tikhonov and Khasis protested their innocence throughout the trial, even as they acknowledged their nationalist beliefs. Markelov was shot in broad daylight in January 2009, just minutes after leaving a press conference in central Moscow. Baburova, who had been interviewing Markelov for the opposition newspaper “Novaya gazeta,” was shot dead as she attempted to protect Markelov. Markelov’s death was mourned as one in a series of deaths of Russian rights defenders, including journalist Anna Politkovskaya, who was killed in October 2006; and activist Natalya Estemirova, a member of the Russian rights group Memorial, who was kidnapped and shot dead in Chechnya in July 2009. Rights watchers hailed the verdict as a rare instance of courtroom justice in a country where many high-profile murders go unresolved. A former juror who resigned from the case told the “Moskovsky komsomolets” newspaper the jury had been pressured to convict Tikhonov and Khasis. A key witness for the prosecution also attempted to retract his testimony, saying he had been forced to deliver it under duress. While the case went on, human rights activists stayed silent – we followed the process attentively. It seems that our many years of experience would allow us to distinguish made-to-order cases fabricated by the intelligence and security services from cases that these same services and structures, with all their telltale marks, investigate in good faith. In assessing the evidence presented by investigators, we attempted to put ourselves in the jury’s shoes, doubting everything that could bring about doubt. Now we can speak without fear that this would be perceived as pressure on the jury. We will speak more about the details of the process at a later time. However, we can say today that we agree with the jury’s verdict – those were the real killers at the defendants’ bench, and not some people arbitrarily accused. We will only make two remarks, as we and our colleagues were mentioned during the trial. The defendants and their lawyers referred numerous times to the testimony of our colleague Natalya Estemirova, who was murdered in the summer of 2009. They mentioned the record of witness questioning that was done in the first days after Markelov and Baburova were murdered, in which Estemirova lays out possible “Chechen” versions of the case. Many of us spoke about a “Chechen” version during our questioning – but only among a long series of other versions. The defendants and their lawyers purposely referred to the murdered Natasha and not to living witnesses who could have been summoned to court today and clarify which of the original majority of versions was the most relevant account. At the same time, in testifying about Stanislav Markelov’s Chechen cases, witnesses spoke most of all not about Chechens but about Russian soldiers and members of Russia’s federal security structures who have been convicted of crimes against civilians in Chechnya. To this day, these convicts still enjoy the sympathy of circles connected to the defendants (it was the lawyer Vasiliev who said that the girl murdered by Budanov – Markelov represented the interests of her parents in court – was supposedly a sniper!). In regards to the contradictions with the lawyer and Kadyrov’s administration, which the defendants mentioned, the situation was not strained in January 2009 – Markelov worked in cooperation with Kadyrov’s human rights ombudsman on the Budanov case. Finally, the defendants and their lawyers pointed to the supposedly entirely probable connection between the murders of Stanislav Markelov, Anna Politkovskaya and Natalya Estemirova, having worked together on the very same Chechen cases. As far as we know, the connection with their mutual case – the case of federal security services officer Sergei Lapin, the so-called Cadet – was not examined in a single one of these three murder cases. In our opinion, the participation of Chechen Republic security structures is entirely probable in Natasha Estemirova’s murder case, but is not at all connected either to Politkovskaya’s murder or with the “federals” in the Cadet case. Finally, as we know for sure, investigators considered the Chechen version of Stanislav Markelov’s murder in detail, not at all as a formality; they did not limit themselves to sending inquiries and orders to Grozny: officials from the Main Investigative Committee were sent to Chechnya in the middle of 2009. Yevgenia Khasis calls herself a “human rights advocate,” using a term that has not been very popular in recent years. But what meaning is given to this concept by nationalists, whose basic ideology is the denial of all people’s inherent equal rights and freedoms (most of all the right to freedom of movement and choice of place of residence)? Let alone by radical nationalists or Nazis (which the defendants are, without question), who confer themselves with the right to violence and murder? It seems that the nationalists are trying to foist their own concepts of truth and rights onto society, not hesitating to defend themselves in court with everything up to falsifying testimony – there was the inept attempt to organize an alibi for Yevgeniya Khasis, which fell apart in the eyes of the public! The defendants’ lawyers tried ineptly throughout the entire case to hide their own positive attitude towards terrorism and their readiness to defend terrorists: indeed, an important goal of the murders of both migrants and public activists like Markelov is precisely the desire to sow fear within society – an openly terroristic intention. Orlov’s original statement in Russian can be found here. Translation by theotherrussia.org.